Christmas is beautiful in Paris. Everything you can imagine: romantic, lavishly decorated, and a bit on the cold side. On our first visit to France, Christmas celebrating was in full swing when we were in Paris in mid-November (since there’s no Thanksgiving, I don’t think anyone gets miffed by Christmas starting in November), and it was beautiful. Whether your personal version of Christmas is an ode to commercialism or is an important religious holiday, Paris is the perfect place to spend the holidays. For the latter, churches and cathedrals like Notre Dame, Sacre Coeur, and others are the perfect places to visit around Christmas. In fact, I loved our first visit to Paris at Christmas so much that I wanted to revisit this post and update it with some new photos and information from my visit to France last November. For starters, if you visit Paris during November or December, you should come prepared for that cold weather. Average temperatures range from around 38 degrees to 60 degrees, so pack your winter coat, hat, and gloves. It can be especially chilly on the Seine River, and since you’ll likely be staying out later to enjoy the lights (and because dinner is typically later in France), you’ll want warm clothing. As for what to do in Paris at Christmas? Well, if you’re not a member of the nouveau riche, you’ll probably want to settle for window shopping as opposed to actual shopping. Let’s start with my favorite spots: Galeries Lafayette. 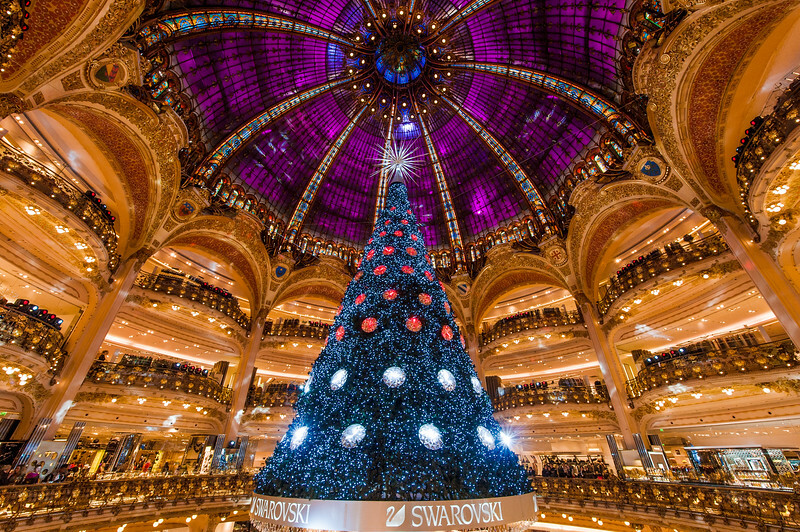 This is an upscale department store in Paris, France that goes all out for Christmas, with this giant Swarovski Christmas tree suspended in mid-air in the center of the mall. The design of the tree changes yearly, with it looking like the above photo a couple of years ago. Here’s how it looked in 2011, and here’s one from 2010 (both, as you can see, by other photographers). As Galeries Lafayette Haussmann celebrated its 100th year in 2012, it seems they went all out with the tree. It was dubbed “The Christmas Century Tree” and stood at 21-meters tall with a Swarovski crystal chandelier hanging below the tree, 120 Swarovski ornaments, and over 5,000 Swarovski stars on it. The Christmas tree was the largest Swarovski object ever produced in Europe. I learned about this tree from a French photographer, and we specifically set out to see it one night in France. It was sort of like a hidden gem at the time, as no other tourists were around gawking at it. Perhaps part of that was the store, which was stuffy and not very inviting. 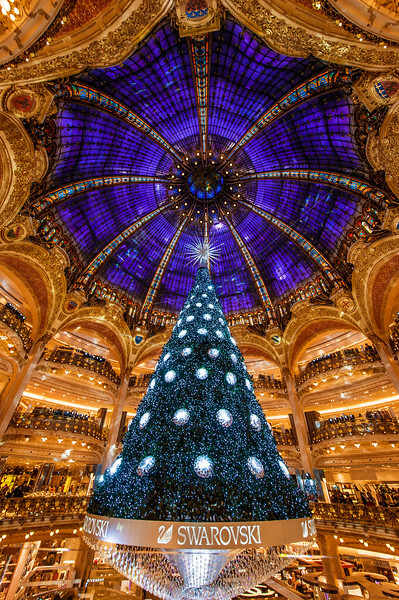 I know Trey Ratcliff visited Galeries Lafayette around the same time we were there and I’ve since seen this listed on a popular website (can’t recall which one) as one of the “coolest Christmas trees in the world,” so perhaps now it is overrun with tourists. I’m sure the staff and wealthy patrons would be amused. Another great draw in Paris at Christmas is the store windows, many of which have elaborate (and sometimes perplexing) displays at Christmas that draw crowds. High-end retailers, malls, and even entire streets really go to town with the decor. I think the area around Galeries Lafayette is the “mall district” in Paris, as there were like 5 malls in the immediate vicinity. One of them had a bunch of crazy window displays that combined taxidermy animals with cold-weather attire (among other accessory) and Louis Vuitton, Fendi, and other luxury goods. If they were in a different context, they probably would have passed as satire or commentary on consumerism. Given their placement in the store windows, I think they were fairly mindless and just meant to attract attention. I really wish I would have taken more photos of them with my DSLR, because description doesn’t do them justice, but I didn’t think to at the time (don’t you hate when that happens). However, I did post them on Instagram with witty (or not) captions back when I saw them. Here are a few of my other favorites that I can’t help but share. Funny stuff, if you ask me. There were a bunch more windows, all about as bizarre, but I think those were the “highlights.” Beyond this, Paris was pretty well decked out for Christmas, from major tourist areas to quaint neighborhoods. I imagine that the Champs-Élysées is normally quite pretty, but covered in white lights, it was beautiful. Neighborhoods we explored had lights strewn up over across streets, and even the cold weather helped make it feel like Christmast-time. I think there’s something to be said for Christmas in the city, and as far as cities go, Paris does a pretty good job of getting in the Christmas spirit. Finally, there’s Disneyland Paris. While not technically in Paris (it’s actually in Marne-la-Vallee), the name has Paris in it, so we’ll go with that. The parks here get really decked out, and have a variety of Christmas entertainment, including a daily parade and nightly mixed-media (fireworks, lasers, etc.) show to end the night. Santa is also there. Suffice to say, I adore Disneyland Paris at Christmas and think it really hits the romanticized high notes of the city. Disney Parks aren’t for everyone, but it’s definitely something to consider if you’ve never been. You can read more in my Christmas at Disneyland Paris post on other blog, DisneyTouristBlog. To get some more Paris, France photo ideas, check out my Paris Photo Gallery. What city that you’ve visited do you think best captures the feel of Christmas? What do you think of the Galeries Lafayette Christmas tree or the “interesting” store window displays? Share any thoughts you have in the comments! I am so thankful I found your website!! I have the indescribable joy of spending almost a month in Paris in December of this year (2019). Your posts are helping immensely. I need information on public restrooms, please. How common are they in Paris–while walking along downtown, in the museums, etc.? We had the exact same thoughts about Galeries Lafayette. It was a very nice place to warm up and that tree was amazing. But prices…WOW. One member of our party hadn’t brought a winter coat and the cheapest coat to be found in this mall was $600! But the light display on the outside of he mall was just amazing. The twinkle lights on the Eiffel Tower were beautiful. And there were Christmas trees up in the courtyard in front of Notre Dame! You need to be a part of a competition for one of the best websites on the internet. I need to make a trip over to Galeries Lafayette. Haven’t been there yet. I LOVE the last photo in this post. I thought I had seen all of your DLP shots but that one is absolutely stunning! I think you forgot about a few things—the Christmas markets and patinoires (outdoor ice skating rinks) are fun on the Champs-Élysées and at La Défense, and other places might have them too. Plus there’s the giant Ferris wheel on Place de la Concorde with amazing views. Ah, great tips, thanks! The post definitely isn’t comprehensive–I’m sure there’s a ton more in Paris at Christmas even beyond what you’ve listed–just some of the things we have experienced in the city at Christmas. Beautiful! I have no desire to ever go back to Galeries Lafayette, but Christmas displays might be enough to draw me back. It’s good to know Christmas is beautiful in Paris, as it’s nice to take repeat trips in different seasons. Some places don’t call for different seasonal visits, but Paris does for me. I think it would be fun to do Christmas Eve and day in Paris. I have a feeling that city has a great feel those two days, in particular.